You'd be forgiven for not knowing quite what this structure is comprised of on the inside. Is it an office building? Is it a sauna? 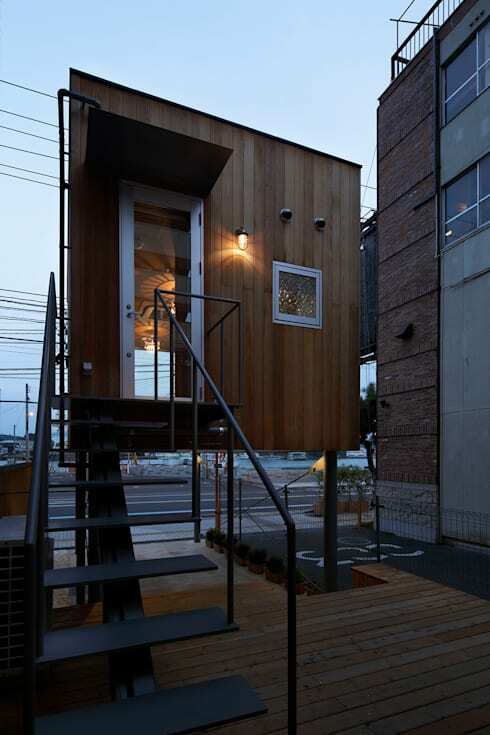 No, it's a new take on apartment living in Japan! There is something nautical in its design, with a railing on top as if at the bow of a ferry. Even the grey door bordered by wood emits a feeling of the sturdy wheelhouse door that fends off rain and sea water when it gets wild outside. 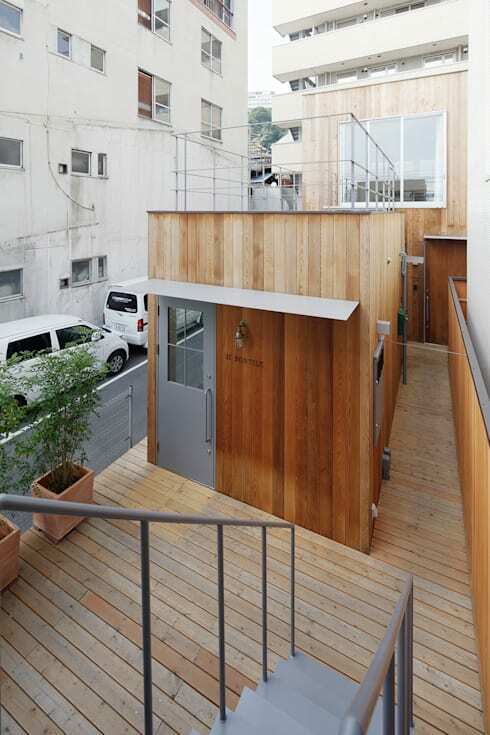 As we can see here, the entire building is finished in wood, with grey used for the metal stairway, doors and window frames. The colour scheme works well and even goes a little towards improving the surrounding buildings by fitting in with their muted tones, offering something more vibrant in the hearty choice of a warm wood finish. Separate to the main structure, this free-standing annex is raised on legs above the decking like a spacecraft hovering on its own! We imagine this would make a good study away from the hustle and bustle of a family environment, or a place in which to meditate or create. Perhaps a writing den or a yoga retreat in which to unwind after a busy day? 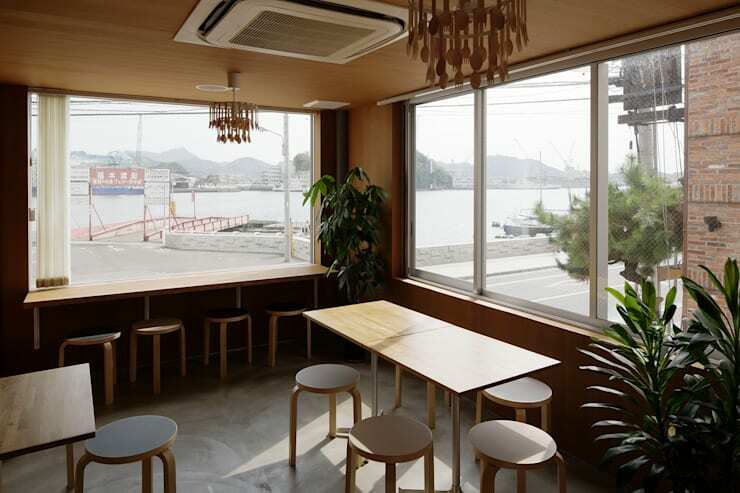 This could easily be filled with plants and a soothing sound system to escape the city environment. This small dining area with minimalist chairs and tables is decorated with plant life, but could also be personalised with a few thoughtful touches from a professional designer. 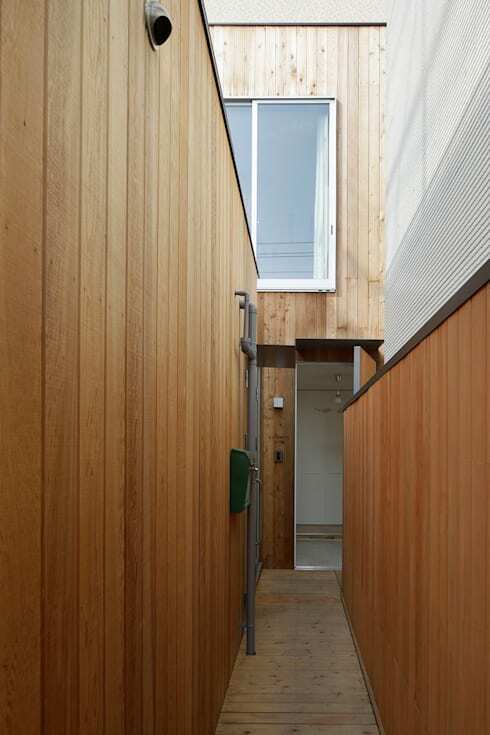 This property includes a little bathroom lying at the end of an alleyway. The architect is clearly trying to create what they can with limited space, whilst still trying to maintain the integrity of unique design in what is a curious, spatial problem. 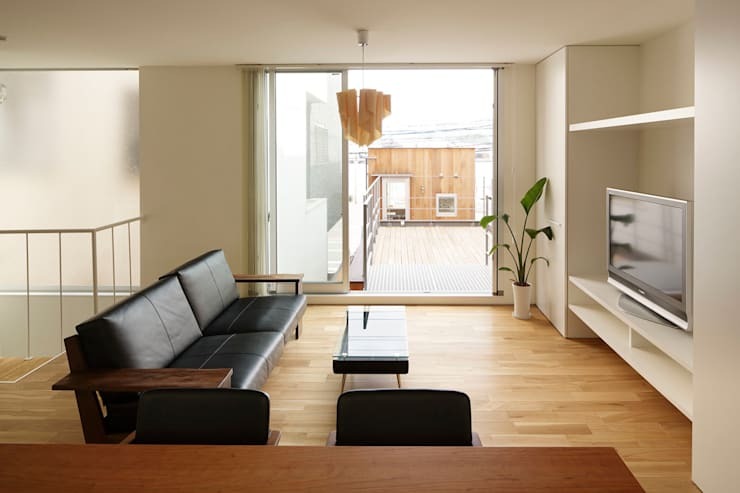 Here we see the open-plan living area with sliding doors facing the annex in a more conventional design. The black couch with wooden armrests works well in the mainly wooded interior. Things are kept beautifully cool and neutral, but some clever decoration and paintwork could also be added if required. The functional metal grating is perhaps not as pleasing as the rest of the decking, but with a nice door mat and some natural plant life could be brought to life in colour and texture. One thing the architect has got very right is the use of lighting, which works so well with the warm wood and makes you want to step inside the inviting little cabin! It is in stark contrast to the surrounding building design which is stark and linear, with distinctive brutalist style. Are you as fascinated by this dwelling as we are? 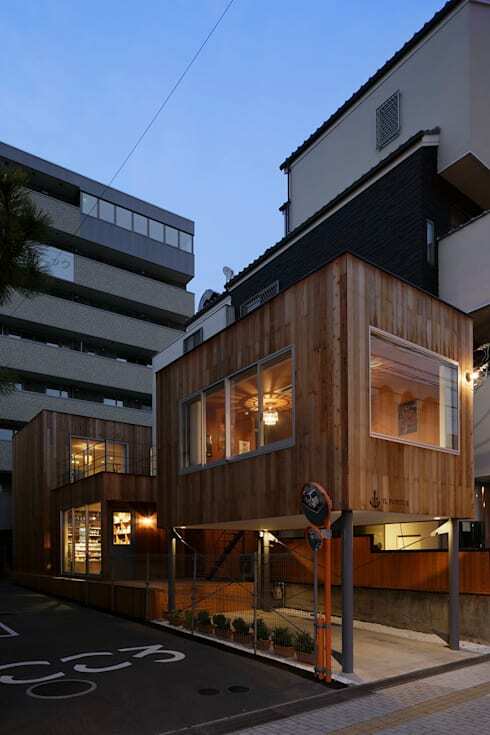 For more quirky Japaneses architecture, check out: A couple's dream bungalow in the countryside. 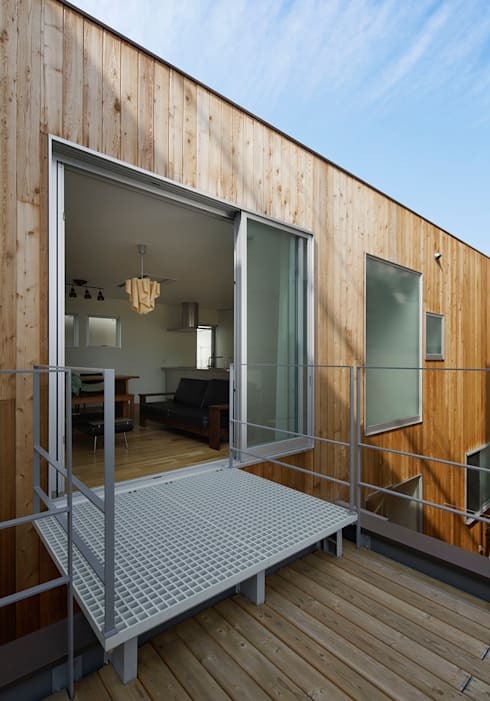 Are you a fan of contemporary wooden homes?